On this day in 2011, Manchester United forward, Wayne Rooney, scored perhaps the Premier League’s greatest ever goal and Citi Sports editor, Nathan Quao, relives the experience. As a football fan, first and foremost, seeing beautiful goals being scored live is a very blessed experience. Whether you are at the stadium or whether you catch the action by kind courtesy of a live television feed, the experience is somewhat magical and it stays with you forever. Those are my emotions every time I watch Wayne Rooney’s bicycle kick goal against Manchester City that was scored on February 12, 2011. I was not at Old Trafford that day but I saw the game live on tv and it was thrilling. But I was bag of nerves before kick-off. My younger brother, though, was very calm and I remember he was listening to Nicki Minaj’s “Moment for Life” before the game. He kept telling me that Man United would win. I wanted that, of course, but I did not believe it was going to be possible. The game itself was very tight and well-contested. Manchester United were hoping to get three points to keep Man City off their backs in the title hunt while Roberto Mancini needed to win to see if his team could get it close to the title. After 41 minutes, Man United made the breakthrough. 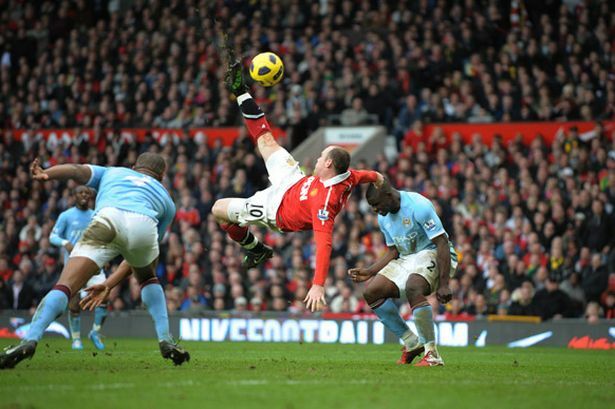 Edwin Van der Sar’s long punt upfield got Rooney into the air and he headed it downwards. Ryan Giggs drifted into the middle from the left and sent a pass to Nani. The Portuguese winger brought the ball down quickly and finished with a left-footed strike past Joe Hart in goal for Man City. Advantage Man United heading into the break. I was happy but I was afraid of a Man City reprisal in the second half. I just could not take my mind off that. The second half started and the away side was getting back into the game. David Silva was running the show while Man United could not find the same sense of purpose from the first half. Meanwhile, Wayne Rooney was having a bad day and I was incensed at his performance. Man City threw on Edin Dzeko and my stomach turned. The Bosnian Diamond’s last trip to Old Trafford resulted in a goal for him and his Wolfsburg side in the Champions League and I was scared he would repeat the trick and get Man City to win. But since Dzeko did not really care about my fears and those of the million and one Man United fans, he found the net albeit in a clumsy way. A cross came in from the right and Dzeko swept the ball towards Van der Sar but David Silva was in the way and the ball went in off his back. What a way to concede goal. Man United 1-Man City 1 after 65 minutes. While all of that was happening, Wayne Rooney’s bad day was getting worse and I was hopping mad at him. I kept yelling at the tv screen for him to get going but he was not responding (as if he could hear me). In the 76th minute, I had reached breaking point but the start of something wonderful was brewing at Old Trafford. Man United went on the attack. Dimitar Berbatov found Giggs and he returned it to Berbatov. He passed to Rooney and he miscued his return. Steam was coming out of my ears now. But Scholes recovered the stray pass and sent the ball down the right to Nani. He steadied himself and sent a cross into the Man City penalty box. That was where the magic happened. I got up from my seat to hurl insults at Wayne Rooney. My younger brother was seated to my left and was watching me. I raised my voice to let it out full blast in Rooney’s direction and he shut me up in the most beautiful way possible. Nani’s cross had taken a slight deflection and so, Rooney had to readjust his position. He went for the spectacular. A bicycle kick past Joe Hart and he wheeled off in celebration. He came to a stop before the Man City fans. His back was turned to them and he opened his arms wide much like a saviour standing before the multitudes. What about me? Well, I stood. I was frozen. Mouth opened wide. Abuse stuck in my throat with my brother looking on with a smirk on his face. What did he say? 12 or so long minutes later, the match ended. Man United had won the derby 2-1 and it was settled by the most magical goal at the time. 8 years on, I still watch replays of the goal and I feel the same way as I did on February 12, 2011 and the reactions of the day make the moment even more special. Sir Alex Ferguson can be seen mouthing the words: “F**king hell”. Anderson jumps up and down in sheer delirium. In 2015, I got the chance to visit Old Trafford for a stadium tour. At the start of the tour, the visitors sit in what is now the Sir Alex Ferguson Stand for a brief overview of the place. After the tour guide had introduced my group to Old Trafford and what it had to offer, I raised my hand and asked where exactly Rooney scored the bicycle kick. The guide pointed it out to me. I sat there with my gaze fixed on the spot and I saw the goal all over again in my mind. It was at that point when I truly realised the magic of the goal.